"First I had a bit of a shiver. Seeing the photos really made me stop and reflect. I experienced a spectrum of emotions. It is very humbling to have played a part in saving someone's life." That's David Walsh, the man behind HeartWatch, an app developed for the iPhone and the Apple Watch that takes advantage of the built-in heart rate monitor to help users detect any irregularities. HeartWatch hit the headlines recently after user James Green shared on Twitter how an unusual spike in his heart rate led him to find out that he had an pulmonary embolism. That's when a vessel in the lungs becomes blocked. It could have proved fatal had it not been detected. Yes, the Apple Watch came to the rescue and Walsh found out that his app was part of this story the way everyone else did. "I actually saw it in my own personal Twitter feed first," Walsh told us. "I'm one of those weird Twitter types. I read it all using Tweetbot in reverse chronological order. It just popped up. "I usually hear about these kind of stories via emails from customers or in App Store reviews. The difference this time was seeing the photos, which made the emotional element quite profound. This really is the ultimate. That's why I built the app, so when this happens, it's very special." The journey that led Walsh to build this app is a very personal one. He was just 20 when his fit, sports-loving dad died of a heart attack during a game of football. After starting to explore his own heart rate activity and noticing the limitations of Apple's Health app in dealing with heart rate data, he decided to come up with his own solution. 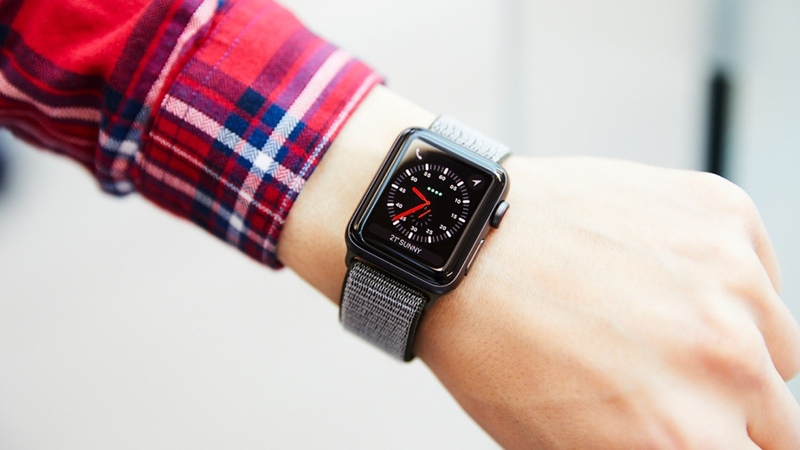 The app is now into its third iteration and fully embraces Apple's smartwatch and watchOS software, whether it's adding complications that can alert you to an abnormally low or high heart rate or even monitoring heart rate activity while you're sleeping with your Watch. He started developing mobile software in 1993, which made building the iPhone app over 20 years later a little more straightforward. When it came to casting his attention to the Watch version, he faced a whole series of new challenges to really make it work well. "Unlike the iPhone where you have an amazing amount of power to do just about anything, the Watch requires a lot of lateral thinking when you develop for it," he said. "I think Apple has made a lot of wise choices with the restrictions that they impose. This drives some people nuts but I really enjoy the challenge. As far as the health data itself, HealthKit is amazingly well engineered. Choosing to make it a platform was an inspired move as it opens up so many possibilities." When dealing with issues of the heart, as with any health monitoring, the tech that's doing the monitoring needs to be reliable. Actually, not just reliable. It needs to leave little or no margin for error. We've covered the topic of optical heart rate sensor accuracy extensively, specifically when it comes to fitness and workout tracking, but it's a whole other debate when you start talking about it in relation to heart health. Something that Walsh is all too aware of. "The sensor in the Apple Watch is very good indeed," he told us. "It all comes down to skin contact. In a non active scenario if you wear it in the correct position it is extremely accurate and also quite intelligent. Most of the criticism comes from workouts that involve a lot of wrist flexion and extension. But there's a solution to this. "I'm actually about to write an article on this exact topic of accuracy. I have been doing a ton of research on it. I have been wearing three watches for my last few workouts and I have the hard numbers to show how you can get results as accurate as a Polar chest strap. I think it's going to seriously shock some people." Apple's heart rate monitoring was a big part of the company's watchOS 4 software upgrade, bringing resting heart rate support, recovery data and heart rate complications to view your ticker in real-time from the watch face. Walsh is already in the process of taking advantage of those new features, having submitted version 3.5 of HeartWatch. Among other features, it'll introduce a new badge for sedentary heart rate. This is a subset of non-active heart rate where you haven't moved for five minutes before the reading is taken. The new feature lets you eliminate any sort of movement when monitoring non-active heart rate, to, "identify elevated heart rate readings that are caused by some other stressor. The heart rhythm tracker uses Apple's onboard HR monitor to measure heart rate every five minutes and can be used to detect serious heart conditions. It's already been used as part of a big clinical study that showed Cardiogram's tech is able to detect atrial fibrillation with a 97% accuracy. This app and smart strap combo brings medical grade heart rate monitoring to your Apple Watch. It uses electrocardiogram (EKG) technology instead of Apple's built-in optical one to improve the accuracy of readings and is able to detect atrial fibrillation. It also offers support for Apple Health and Google Fit. "I have also added a lot of new workout based heart rate monitoring features including custom haptic alerts during workouts, as well as seventy types of workout and I've built on and improved the two minute recovery test," he added. "This is very valuable indicator of heart fitness. In this update you can track this, receive a star rating on your heart fitness and also monitor it under controlled conditions with a two minute haptic timer. This makes this data extremely useful rather than a novelty. I'm also going to be exploring the HRV implementation in some more depth but that's for the next update – it needs to be useful." While Walsh is making the most of what Apple has to offer with its current hardware and software, he does have some clear ideas on how its Watch could provide even greater health insights. Apple's Heart Study app, which will see the company explore ways it can detect atrial fibrillation, is considered a huge signal of Apple's intention to get serious about heart health. "The work that is going to be done by Apple on AFib is fascinating," he said. "I'll be watching it very closely. This is a condition that happens in the heart itself, and is hard to measure as an outcome of blood flow at the pulse. As it stands, you can get valuable metrics that can be used in monitoring a known condition, but a hard diagnosis of the issue would be a whole new level. "I'm planning to tie in blood glucose and blood pressure reporting into the iPhone app. Currently it lets you speak your measurements into the Watch, but if this could be captured by the Watch itself it would open up amazing possibilities." While wearables are already making great strides in offering a wide range of heart rate metrics and insights, Walsh feels there is still more that can be done. In addition to plans around fitness and training readiness, Walsh feels that having an LTE-enabled Apple Watch Series 3 could help drive new-found uses. "I recently got an email from a concerned father whose daughter suffers from POTS," he said. "This is a condition where the heart rate jumps and causes fainting. It can happen anywhere. So I built them an app that detects the jump and starts a timer that will send an alert to her parents if she doesn't touch OK on the Watch within 30 seconds. This way the alert only goes if she faints." Walsh tells us he could see this type of app extending to other areas such as alerting relatives if an elderly parent has had a fall or if a loved one has had a seizure. "I think one of the biggest areas in wearable health technology is about knowing family members and loved ones are OK," he said. "This is priceless. Building this on CloudKit also means privacy is maintained and that is essential with health data. I'm going to be doing a lot of stuff in this area." So what's next for HeartWatch in the near term? The latest app update has started rolling out and while Walsh is not talking too many details, his app is being used for studies to delve deeper into the world of health monitoring. He's also pushing on with his AutoSleep sleep tracking app, which he believes has more value now that Watch battery life has improved. Plus there's the haptic smart alarm that wakes you in a lighter sleep phase or after you've had a certain amount of sleep and a fitness app made in conjunction with a "major elite sports company" in development too. It's clear that ambition to help people stay safe, whether it's during a workout or just going about their normal day, is what drives Walsh to explore what's possible with Apple's smartwatch and the wider world of wearables. For the foreseeable future, he's going to be a busy guy.